There are a lot of great places to take a family vacation across the globe. Where you end up choosing to go is usually determined by a few factors: what activities are there for you and your kids, what’s the weather like, how far will you have to travel, will your kids learn anything, is there anything we won’t be able to find anywhere else? These are all good questions to ask yourself before planning a trip for your family. But one place that is always overlooked as a destination for travelers, especially traveling families, is Baja. Baja, a peninsula just south of California, is different than the rest of mainland Mexico. Baja was able to develop separately and cultivate its own culture, values, and identity. It’s a great place with a wealth of options for families to have an incredible vacation. Here are five of the top reasons to go to Baja for your next family adventure! Baja is one of the best places in the world to get up close and personal with all different kinds of marine life. The Sea of Cortez is one of the most bio-diverse bodies of water on the planet, earning it the nickname “The Aquarium of the World” from Jacques Cousteau. In Baja you can swim with majestic gentle giants of the ocean, Whale Sharks. 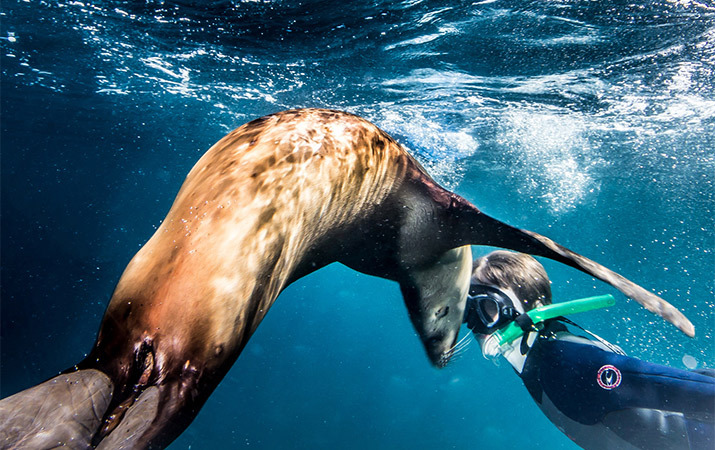 You can also swim face-to-face with smaller more playful sea lions! It’s the most fun your child will have in the water! In November, the largest whale migration in the world takes place in Baja, making it the best place to go whale watching— you may even get a baby whale to come right up to your boat and say hello! Baja is just south of California. It’s an easy flight, not too far from anywhere in the U.S. Shorter flights and easy routes are a big plus for traveling families. With average temperatures in the mid-70s, beaches to relax on, deserts to hike in, and quaint towns to explore, its perfect for adventure. Many chefs have migrated to Baja over the past few decades, opening up small restaurants with explosive local flavor. Everything is delicious from tacos and ceviche to guacamole and ice cream, the local treats are better than you can dream of. And for adults, the margaritas are exactly what you’ll want after putting the kids to bed! There is no shortage of multi-sport adventures on the peninsula. From ATV rides in the desert to hopping on a surf board the options on land and in the sea are endless. One of the best things to do is kayak around the Sea of Cortez. It’s hard to find a more tranquil and beautiful location to enjoy this activity. Throw in a couple of cliff-top hikes and snorkeling expeditions— your family will have fun from start to finish. The people in Baja are kind, wonderful, friendly, and love to meet visitors! The culture here is a bit different than the rest of Mexico due to the history of the peninsula, dating back to when it was first settled by Jesuits, and more recent migrations of adventure sport enthusiasts, chefs, artists, poets, and writers. Together they’ve all created a unique and beautiful culture of kindness and fun! Thanks to See the World contributor Nick Biblis, Thomson Family Adventures.